Pahrump Valley High School’s boys cross-country team has a very different look this season. Three runners who finished in the top 12 at the Class 3A Southern Regional championships a year ago were seniors, leaving some very big shoes to fill. 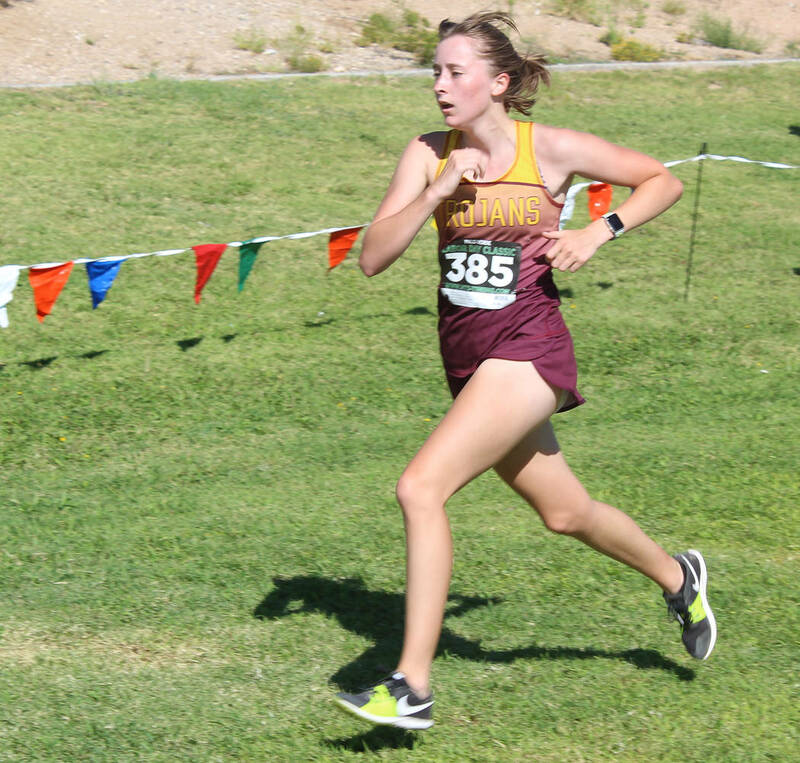 Tom Rysinski/Pahrump Valley Times Pahrump Valley senior Katherine Goodman was the Trojans' top finisher at the Labor Day Classic in Las Vegas, covering the 5K course in 24 minutes, 38 seconds. Tom Rysinski/Pahrump Valley Times Jacob Cipollini, left, of Pahrump Valley goes toe to toe with Clark's Michael Finley near the finish line of the Labor Day Classic at Palo Verde High School. The two finished in 19 minutes, 13 seconds. Tom Rysinski/Pahrump Valley Times Beatty junior Jose Granados nears the finish line of the Labor Day Classic at Palo Verde High School. Granados finished 14th in the junior/senior race in 18 minutes, 8 seconds. Tom Rysinski/Pahrump Valley Times A field of 133 runners breaks from the starting line of the boys freshman/sophomore race during the Labor Day Classic cross-country race at Palo Verde High School in Las Vegas. Tom Rysinski/Pahrump Valley Times Junior Nrsringa Breathwaite of Pahrump Valley covered the 5,000-meter course at Palo Verde High School in 27 minutes, 19 seconds at the Labor Day Classic. But patience is a virtue in a sport in which you spend the regular season preparing for the postseason, and the Trojans didn’t exactly start the new season with a bare cupboard. 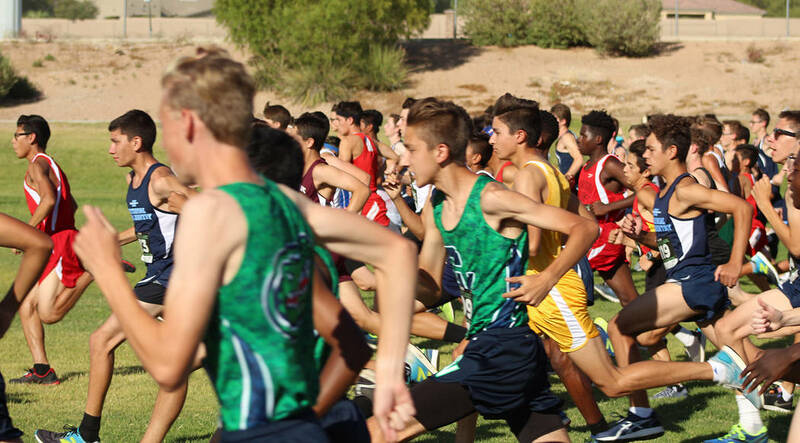 The Trojans finished 10th in the junior/senior race Saturday in the Labor Day Classic at Palo Verde High School in Las Vegas, but much of the competition came from larger schools they will not see in the postseason. 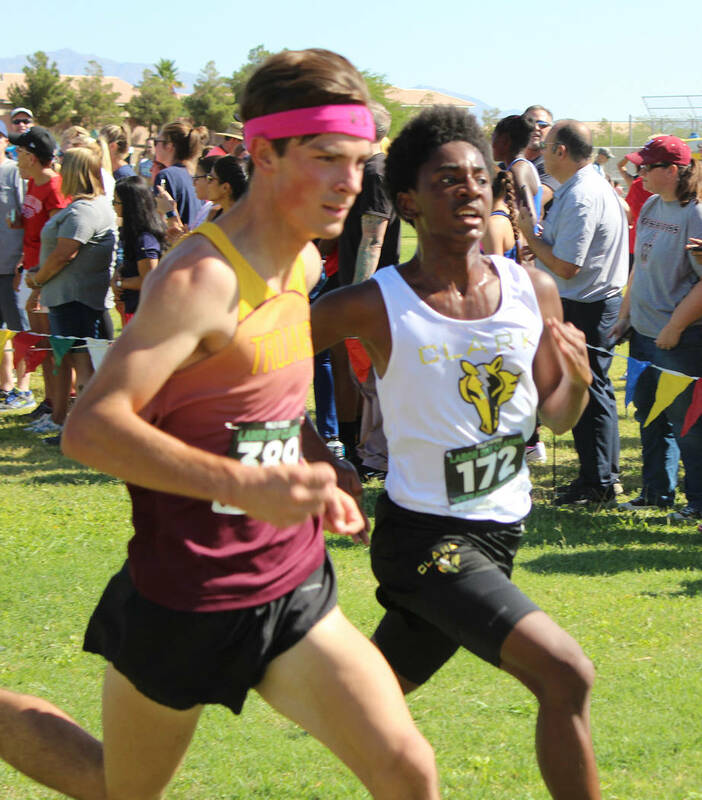 In fact, all but two of the 16 competitors who finished ahead of Pahrump Valley’s top runner, junior Michael Sonerholm with a time of 18 minutes, 24 seconds, are from Class 4A schools. Moreover, all nine teams that finished ahead of the Trojans in the team scores are Class 4A schools. They stood fairly well Saturday, with three other Trojans finishing in the top third of the 164-runner field. Senior Jacob Cipollini placed 34th in 19:13, junior Grant Odegard finished 46th in 19:47, and junior Brandon Ruud’s 19:54 was good for 51st. Almost bettering all three of them was freshman Seth Sonerholm, whose time of 19:15 was good for 12th in the freshman/sophomore race. 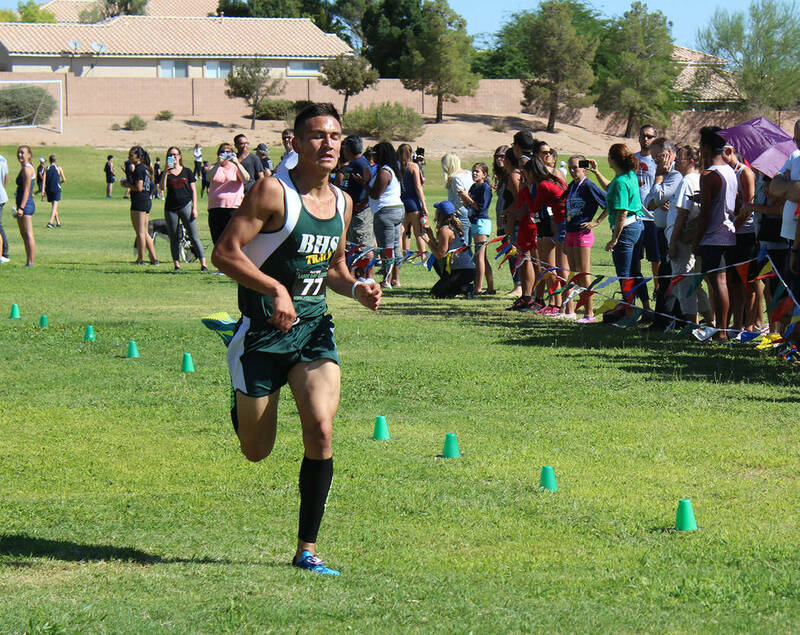 Meanwhile, Beatty track standout Jose Granados finished 14th in his second cross-country race. 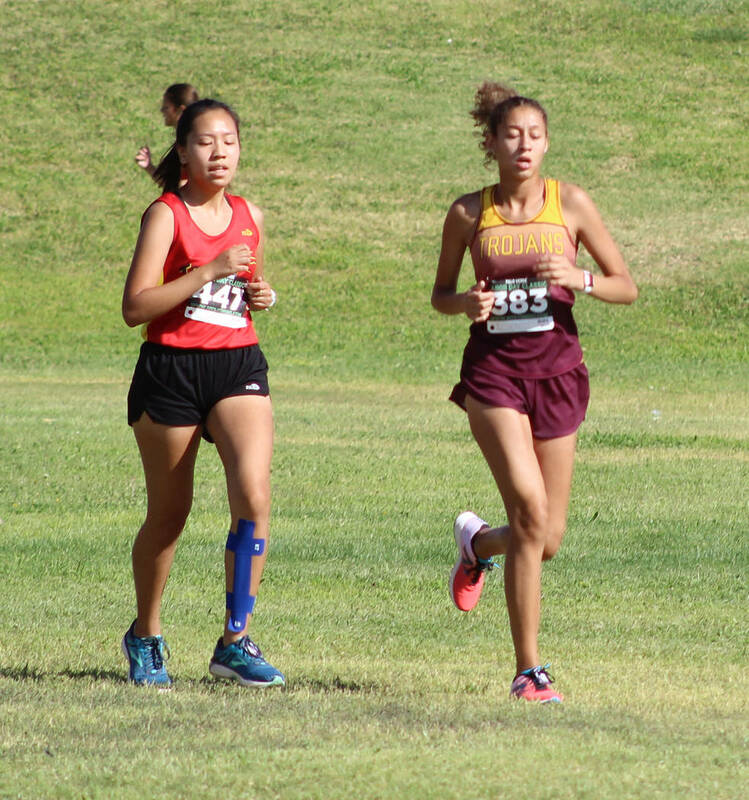 Like Granados, Pahrump Valley sophomore Patricia Roundy is new to the trails. She ran track for the Trojans as a freshman, but she didn’t compete in anything longer than 400 meters. Roundy remained alive throughout the 5,000-meter course at Palo Verde High School, finishing 36th in the freshman/sophomore race with a time of 25:21. Senior Katherine Goodman was the Trojans’ top finisher in the junior/senior race, placing 38th in 24:38. Junior Diamond Sonerholm was 66th in 26:42, and junior Nrsringa Breathwaite finished 75th in 27:19. The race drew 102 entrants. Freshman Beverly Roundy also competed in the the freshman/sophomore race, finishing in 32:25. Next up for the Trojans is the Larry Burgess Las Vegas Invitational on Sept. 8 at Sunset Park in Las Vegas. Pahrump Valley will get a better look at its postseason competition, as eight other Class 3A Southern teams are scheduled to be there. Girls Golf: Sophomore Breanne Nygaard shot a 4-over 76 Tuesday to finish 13 strokes clear of the field in Pahrump Valley’s opening Sunset League match of the season Tuesday at Aliante Golf Club in North Las Vegas. Nygaard recorded 12 pars and a birdie on No. 8, shooting 1-over on the front nine and 3-over on the back nine. Seniors Makalea Petrie (93) and Jessica Pearson (98) also broke 100 for the Trojans, the only school to factor in the team scoring. Boys Soccer: While the Trojans’ girls volleyball team was sweeping Virgin Valley, the boys soccer team was treating its guests from Mesquite with equal rudeness. Fernando Martinez-Fontana posted two goals and two assists for the Trojans in a 5-0 rout of the Bulldogs. Jose Chavez added a goal and two assists, Alvaro Garcia and Christopher Vega also scored goals, while Sergio Sanchez recorded an assist. Two days later, Chavez posted a hat trick in the Trojans’ 4-1 win at Boulder City. Pahrump Valley is 2-3. Girls Soccer: The Trojans avoided a third consecutive defeat when Madelyn Souza connected for a second-half goal to forge a 1-1 tie with the Arbor View JV in the Las Vegas Kick-Off. After a 4-0 loss to Liberty in the tournament on Monday, the Trojans dropped a 1-0 decision at Virgin Valley on Tuesday. Souza and Kimberly Ramos scored second-half goals Thursday as the Trojans blanked Western 2-0. Raelean Sutton made 11 saves to post the shutout. Girls Volleyball: Elaina Dattilio recorded 14 kills as the Trojans rallied from a 2-0 deficit for a 21-25, 17-25, 25-20, 27-25, 15-8 win over Cheyenne on Friday night. Kate Daffer registered seven hills, while Nicky Velazquez and Kaden Cable contributed six apiece. Jackie Stobbe added six assists for the Trojans (5-4).